One of my biggest passions is cycling. When I can mount my bike, I will, and the terrain, climate and infrastructure here in this part of Spain (and probably all over Spain) means that every single ride is nothing short of epic. 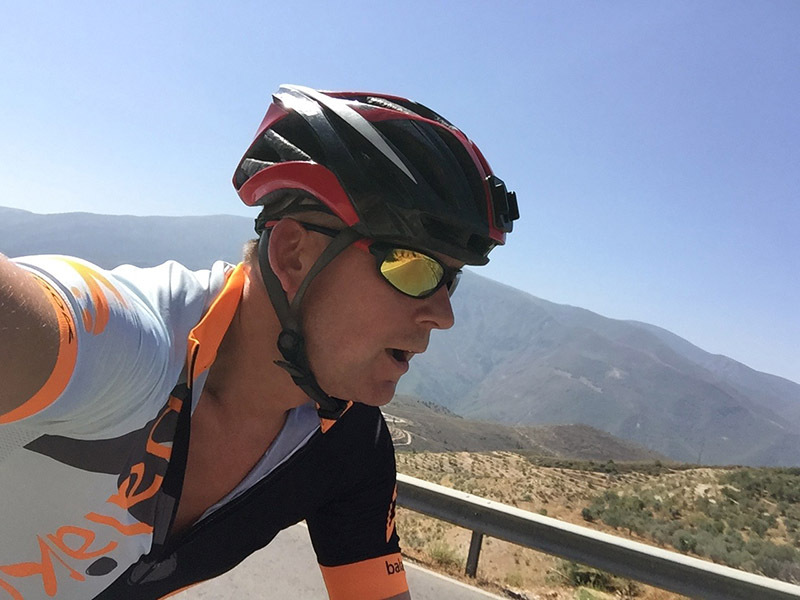 If you've read this blog from the very beginning you may remember a post about 'getting fit' where I explained that I failed to complete the ascent of the hill leaving our village. Well, you will be pleased to know that I have conquered that hill a few times now along with many, many others! Earlier this year I was fortunate enough to meet a fellow cyclist called Chris who lives in the next door village, Albuñuelas. Not only has he been great fun to ride with but he has shown me many routes in the local area that would have taken me ages to discover. There are a few fundamental elements here in Spain that result in this country having some of the best cycling routes in Europe. The climate, year round, is sympathetic for cycling; by that I mean it has little rainfall but there are times of the year when it's very cold and very hot. Below is a picture of a fairly rural road near our village. Can you see potholes? Roadworks? Discarded rubbish? Another key factor that makes cycling here fantastic is the terrain. Round these parts 'flat' is rare and hills are frequent and dramatic. But with the roads as well maintained as they are and often cleverly hair-pinned when the climbs are super steep, there really is nothing here that's not manageable (you just need to be in the right gear, yes?). Well, I'm not going to lie, it's challenging but what I love is seeing cyclists of ALL shapes and sizes and ages on these roads. Over 50's men AND women in fact I fairly regularly see cyclists who must be at least 70! And the one legged cyclist of course. All in lycra - and don't snigger... Seriously, lycra is PRACTICAL! Try cycling on these roads in anything other than lycra and you'll be forced to stop due to agonising chafing in places you really don't want chafing. So, Spain makes cycling inclusive. You can ride at any speed; no-one expects you to race and everybody will say ¡hola! Everyone is friendly even if they are overtaking or zooming off in the other direction. Personally, I like to go at a relaxed pace and have a good look at the scenery which will undoubtedly be stunning, be it of vast mountain ranges or cool pine lined roads, there is always something to look at and admire. Another element that makes cycling a joy here is the availability of fresh clean natural spring water fountains that can be found in almost every village. When temperatures are mid 30sC and you have hills to climb the biggest fear is running out of water. I will often plan my routes according to the location of water fountains. My favourite being at the spa town of Lanjarón which is actually famous throughout Southern Spain for its fresh spring water. Above all, cycling here is nothing short of euphoric. I can leave the house feeling tired and grumpy and come back feeling like I've not a trouble in the world and I promise you - no doping involved! My current favourite loop takes in the old motorway to the Mediterranean coast to Motril (which is pretty much empty now there is a bigger, better motorway running parallel) then the south side of the Alpujarran valley, across to Orgiva, up to Lanjaron and up again to Talara, the mouth of the Lecrin Valley and back to our village. It's about 3 hrs; I like to stop in Orgiva for a coffee before the big climb. I haven't mentioned mountain biking mainly because I haven't tried it here yet, but I will! The off-road routes are spectacular, I've been told, and suitable for a wide range of abilities, I know that there are more signed routes being created all the time, When I've given it a go, I'll post about it.